Iranian election: Moderates win in Parliament, assembly. Hey, Actual Good News! Moderates Win Big in Iranian Elections. 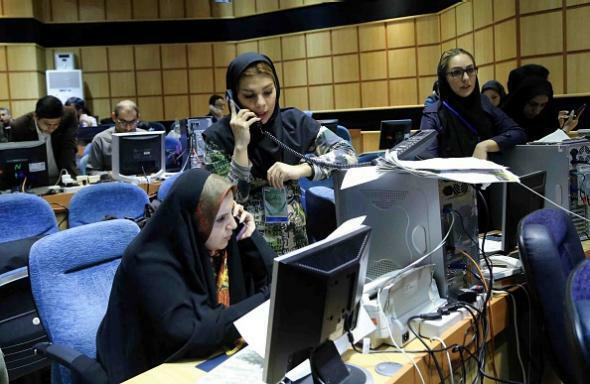 Members of the Iranian press report on election results at an Interior Ministry building in Tehran on Sunday. Iranian moderates who back the historic nuclear deal reached last July have won majorities in both Parliament and the assembly that appoints the country’s supreme leader, reports say. In Iran’s Parliament, the New York Times writes, “reformists … won at least 85 seats. Moderate conservatives, who also supported the nuclear agreement, won 73.” Together that means 158 of the chamber’s 290 seats will be held by non-“hard-liner” legislators. President Hassan Rouhani—a centrist with reformist leanings who backs greater social and economic freedoms and better relations with the West—is up for re-election in 2017; the Guardian calls this year’s results a “humiliating blow” to the hard-liners who have objected to his policies. *Correction, Feb. 29, 2016: This post originally misspelled Ayatollah Ali Khamenei’s last name.